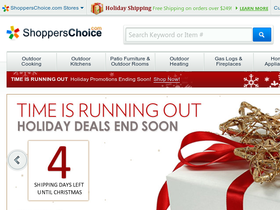 Visit Shoppers Choice online at ShoppersChoice.com for just about everything you could ever want or need. What started as a store selling grills, ShoppersChoice.com has now become an online retailer offering over 15,000 products. With everything from grills to electronics, from patio furniture to kitchen supplies, from jewelry to toys, ShoppersChoice.com is a one stop shop for everything you need. Save some extra money by checking 58Coupons.com for extra Shoppers Choice savings, Shoppers Choice coupons, Shoppers Choice promotions and Shoppers Choice discounts. ShoppersChoice.com is now offering Free Shipping on select items. Click link to start shopping. ShoppersChoice.com is now offering a 10% discount on Summerset patio furniture with this coupon code. Click link. Shop for patio sets on ShoppersChoice.com and you can find a great selection starting from just $149.99. Free shipping for all patio Sets. Save 5% at ShoppersChoice.com with this coupon code at checkout. Click link. Just use this coupon code on ShoppersChoice.com and you can get a free patio heater with select gas grills. Check out ShoppersChoice.com and you can save up to 30% off outdoor BBQ grills. Check out the great selection of fire pits on Shopper's Choice and you can save up to $200 or more. Click link to view. Don't miss out on the deal of the day from ShoppersChoice.com where you can find savings up to 60% on select items.